According to a ChangeWave survey, consumers show a similar level of interest in purchasing a rumored iWatch from Apple, as were interested in buying an iPad just before the Apple tablet was announced. 14 percent of respondents indicated that they are ‘somewhat’ likely and 5 percent ‘very’ likely to purchase an iWatch, with current owners of Apple products significantly more likely to buy an iWatch. “How does this level of interest compare to earlier Apple products before they were formally announced? 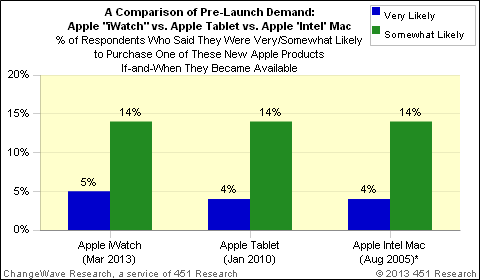 While there are no exact comparisons, here are the Apple "iWatch" results in relation to the ChangeWave pre-release findings for two earlier very successful Apple launches – a January 2010 survey on the original Apple Tablet and an August 2005 survey on the Apple Intel Mac”. 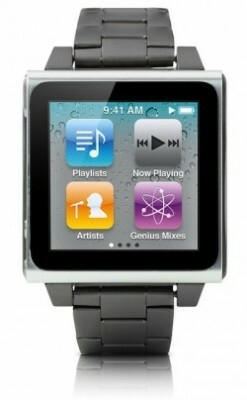 Rumors relating to the iWatch have indicated the device will have a "full" version of iOS, instead of the simpler operating system used on the iPod nano. In addition, The New York Times claimed the iWatch would have a curved glass display.